Traveling – a great way to escape from your daily routine and clear the mind. I love to keep track of places I’ve been. It keeps the good memories alive and it’s fun to relive the beautiful moments you had! In this post I’m going to talk about how I do this with my bullet journal. I’m talking about the Travel Tracker. Let’s get started! It’s easy to forget all the beautiful places and memories of your journeys. That why we take photos and share them with the world. But I think photos don’t tell the whole story. You lose the emotions and the ambiance. This is where the bullet journal shines. You are still able to put a photo in it to show what happened, but you are also able to write down the feelings you had at the moment. The travel trackers make these stories more interactive and fun to read. It is basically a map where you track which countries you have visited with a ton of colors. You can have different maps: one country, one continent, or even the whole world. The fun of maps is that you can point out where you’ve been to everyone. I think it makes the experience of reliving the places so much better! I always keep a diary when I’m traveling somewhere. It’s possible to use the map as a reference for where you’ve brought this diary. This way, you can always read back what you’ve done in each place. 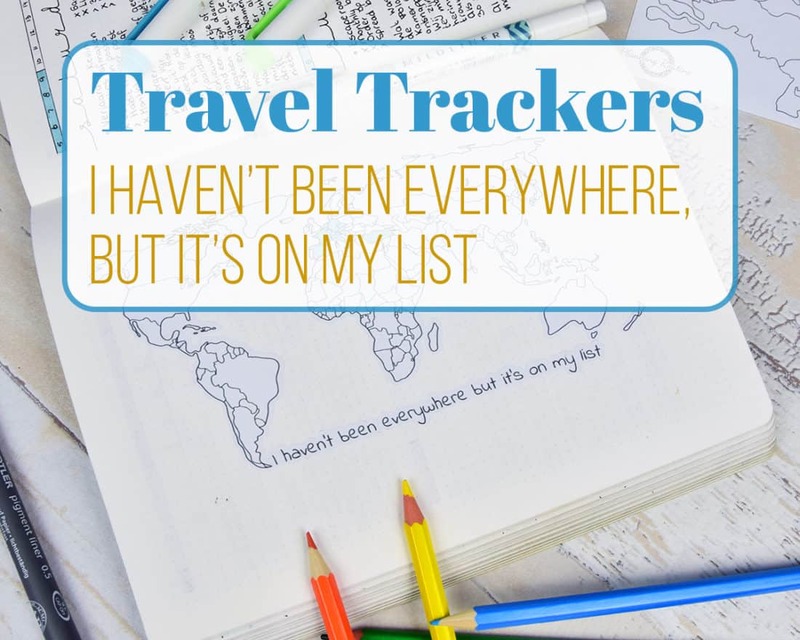 There are a ton of ways to mark where you’ve been on the travel tracker. I love colors, they make me happy, so I use them to brighten up the maps! Take, for example, the map of my home country: the Netherlands. I like to use Zebra Mildliners to color my maps. I love the colors of these markers. They are beautiful: not too bright with some unusual colors that you wouldn’t expect from highlighters. If you haven’t yet, you should really check them out! I find maps pretty hard to draw by hand. What I usually do is print out a map and trace it, but an easier and faster way is to simply buy stickers. I sell a lot of maps on Etsy in different sizes for different locations! If your location is not in there, just message me and I can make a custom sticker for you! The stickers are made from matte white sticker paper and can be drawn and written on, just like regular paper. 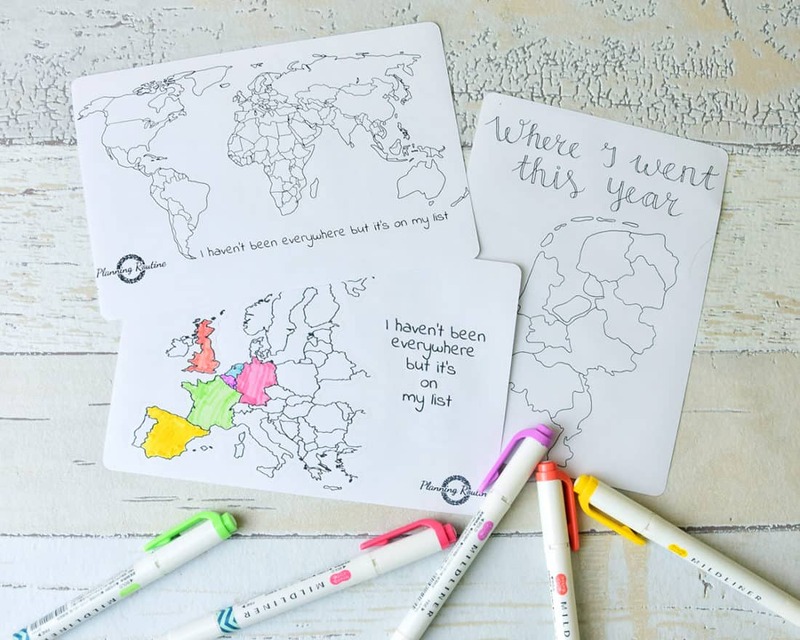 Perfect for your bullet journal or planner! There are a lot of other uses for a travel tracker. In fact, everything that involves a location could be tracked with a travel tracker! Let me give you some inspiration for your next tracker. Who doesn’t love receiving a nice handwritten letter from your beloved ones? Track where all the personal letters are coming from or sent to! Every letter has story to be told, so it deserves a place in your bullet journal. Don’t know what geocaching is? It’s a hobby where people across the world search for little boxes hidden in public places and put little things like a message or keychains in them. The fun comes with finding unique things and coming at places you’ve never been before. You never know what you’re going to find! The travel tracker is perfect for geocaching! Use it to track all the caches you’ve found so far and what story each cache had to tell. Maps that are more zoomed in are perfect for this, because there can be quite a few caches in a small area. If you own a small business, it can be fun to track where you’re products are going. It is not only fun, but also very useful to see where you are popular. Understanding you’re customers is a great way to improve your business! The travel tracker is a nice collection for the bullet journal. There are a ton of different uses for the travel tracker. 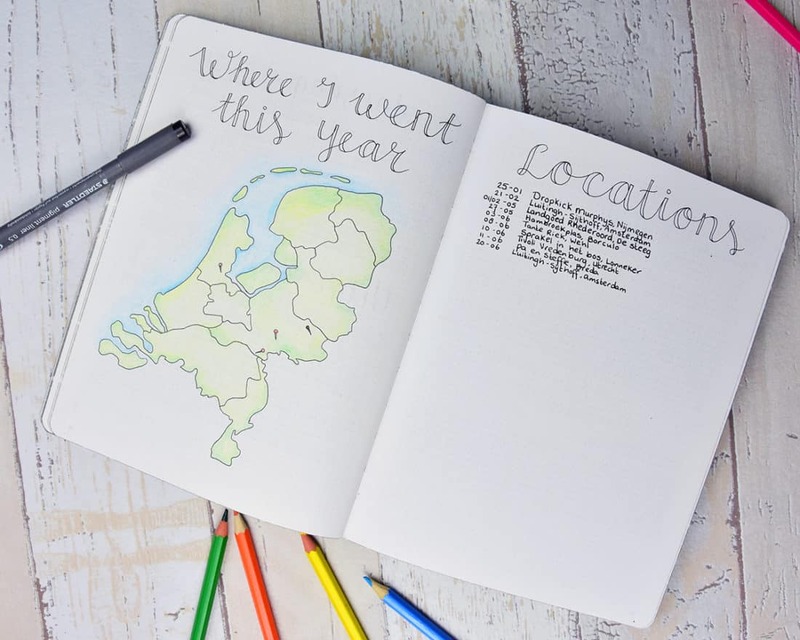 Combined with the bullet journal, it’s a great way to track everything that involves a location. 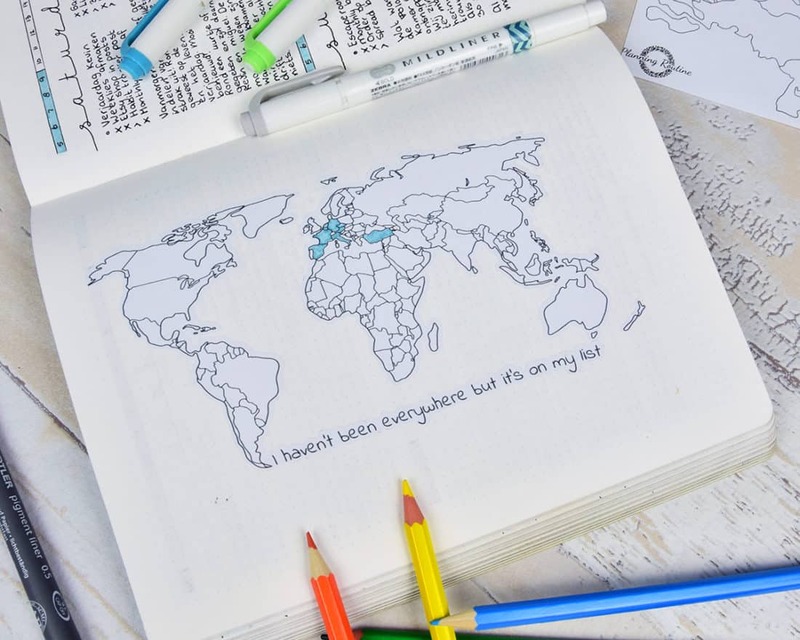 You can get your very own travel trackers on Etsy. Your map not available? Just ask for a custom order and I’ll make them for you! So where are you traveling next? Do you have any trips for this summer? Let me know in the comment section below or leave a message on my social media. I’d love to hear if you like this post! « Pretty Planners – An Investment or a Waste of Time?